Dundee United are looking to re-sign their former striker Simon Murray - despite him playing the second half of this past season at rivals Dundee. Murray left Tannadice last summer after agreeing a pre-contract move with Hibs prior to the conclusion of United’s failed play-off campaign. After a quick start to life at Easter Road, including seven goals in the group stages of the Betfred Cup, he fell out of favour in January and was shipped out to Dundee in the three-way loan deal which saw Scott Allan come back to Easter Road and goalkeeper Scott Bain move to Celtic. Murray grew up as a supporter of Dundee but spurned their advances in order to sign with United in January 2015. 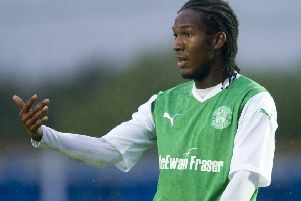 Csaba Laszlo will be hoping he does likewise this summer if Hibs are willing to negotiate the player’s transfer. The Dundee Evening Telegraph are reporting that the ex-Jambos boss has identified Murray as the man he wants to spearhead the United attack next season as they aim to secure promotion back to the Premiership at the third attempt.